Jesus is a man for the ‘I’ word – and not in a boastful way. He speaks of the bread in the desert, the manna which nourished the people in their wanderings. He builds on their belief in a bread from heaven, but now that he himself is the bread. The bread gives life to the soul. Our Christian faith is centred on a person, not on a book. The gospel is the book of life because it is the book of Jesus. Jesus is our life because he comes from God. So we call this at times the bread of heaven. What more ordinary ways can heaven and earth be linked than in the most ordinary of foods. In another country he might have said he is the ‘rice’ of life. it means that in the ordinary events of our lives, God is very near in Jesus. 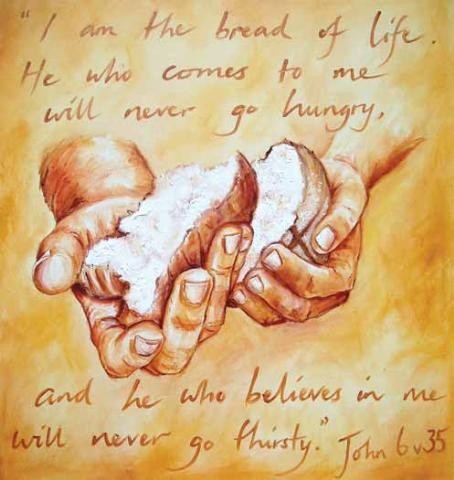 He makes his home in us as the bread we eat becomes part of us. The same with love – our faith links always human and divine love, and human love of all sorts is a share in the divine life of love. Can we really believe this? That the next time you really love your child, your friend, your spouse or anyone in your love-life, you are bringing them a bit of God! That is one of the main reasons why we want to live in love. That we link heaven and earth, divinity and humanity, Jesus and ourselves,. Then the ‘I’ of Jesus becomes the ‘we’ of his earthly body and presence now. This entry was posted in Gospel of John, Gospel Reflection, Liturgy Resources, Prayer Resources, Scripture, Year B and tagged 17th Sunday Ordinary Time Year B, 18th Sunday Ordinary Time Year B, bread from heaven, Bread of Life, Donal Neary SJ, Gospel Reflection, Gospel Reflection for August 2nd 2015, Jesus, Jesus Christ, John 6:24-35, Lord Jesus, Love, Mass, Sunday Gospel Reading and Reflection. I would like to begin by thanking you for your very thought-provoking and challenging “Gospel Reflections”. To be honest your reflections do not always sit well with me and I do believe this is positive, as it is moving me out of my comfort zone. My faith in God is in my opinion becoming more real and has an impact on the way I live (I’m trying!). When I go to Mass on a Sunday I do listen more attentively to the readings, especially to the Gospel. The fact that I have read and reflected on your reflection before attending Mass means that my mind and heart is more open to God. In the past I just went to Mass and found my mind wandering during the readings, this is not the case now. On Sunday morning last I logged onto my computer and opened your email which was sent at 5.21a.m. – you are indeed working very hard. Fr. Neary I would greatly appreciate if you could send your “Gospel Reflection” on Saturday afternoon/evening as I could reflect (and I hope pray) on the contents of your reflections on the Sunday Gospel. Thank you for your thoughtful comments. I am happy to learn that you find the reflections are useful to you. Apologies for being late with publication from time to time.